With a motto like “Bingo at its Best” it better have a reputation to back it up. No other site can do this the way Cyber Bingo can. For online Bingo longevity they are a dinosaur in the industry. That in itself speaks volumes for their reputation. Cyber Bingo has been around for a very long time and is one of the largest online bingo sites with a history that dates back to 1996. It was only a matter of time where UK players were warmly welcomed with features that allow them to play for money in pounds. With years of virtual experience and a vigorous marketing team Cyber Bingo drives a hard bargain for other sites to compete. The site has an outstanding reputation and has won many impressive awards through the years. The layout of the site is cheerful and contemporary in design as they strive to keep up with modern trends. Cyber Bingo is powered by Vista Gaming and uses its own unique Proprietary software with several brands within the network. Players won’t be disappointed with an impressive variety of games available to keep you busy and never bored. Bingo games run around the clock so whether you are an early bird or an night owl there will always be action in store. There are up to 8 amazing bingo rooms you can engage in adding some great variety to your online bingo experience with something for everyone including a Tourney room, Bingo Free Roll and USA room where players can mingle from across the pond. There are both 75 ball and 90 ball bingo games on offer that are reasonably priced for the budget minded player. The Progressive Jackpots are mind blowing with prizes that reach huge amounts. Video Slots are unique because each game gives players an option to choose from a more modest 9 lines up to 21 lines for the more aggressive player. Classic Slots, Video Poker and a variety of Casino games are available. Cyber Bingo has an aggressive promotional campaign and players will never be left in the dark on the latest offers regularly sent to you via email. Free Bingo is offered every day of the week in the Bingo Free Roll room where real cash prizes are given away. Don’t miss out on the main event where a whopping $1,000 Free Bingos games are played every Friday night in the Tourney Room. 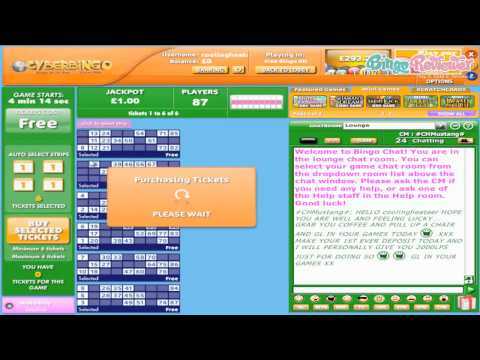 New players are offered one of the largest Bingo Deposit Bonuses available online. For all other players they are not forgotten because a generous daily Bonus awaits you on all deposits made within the required minimum. Earn Loyalty Points every time you play and see how loyalty pays off in a big way. Click on the Bingo Points tab to see what valuable offers are available for you. Because of the longevity of this site they are in a position to offer superlative promotions. The large player base allows them to pass on massive Jackpots to the customer. Cyber Bingo embraces a large global community including players from the US. We rate Cyber Bingo with 4.25 Pink Hearts.